An acoustic neuroma is a slow-growing tumor of the nerve that connects the ear to the brain. This nerve is called the vestibular cochlear nerve. It is behind the ear, right under the brain. An acoustic neuroma is benign. This means that it does not spread to other parts of the body. However, it can damage several important nerves as it grows. Acoustic neuromas have been linked with the genetic disorder neurofibromatosis type 2 (NF2). The symptoms vary, based on the size and location of the tumor. Because the tumor grows so slowly, symptoms most often start after age 30. The health care provider may suspect an acoustic neuroma based on your medical history, an exam of your nervous system, or tests. Treatment depends on the size and location of the tumor, your age, and your overall health. You and your provider must decide whether to watch the tumor without treatment, use radiation to stop it from growing, or try to remove it. Many acoustic neuromas are small and grow very slowly. Small tumors with few or no symptoms may be watched for changes, especially in older people. Regular MRI scans will be done. Surgery or a type of radiation treatment is done to remove the tumor and prevent other nerve damage. Depending on the type of surgery performed, hearing can sometimes be preserved. The surgical technique to remove an acoustic neuroma is called microsurgery. A special microscope and small, precise instruments are used. This technique offers a higher chance of cure. Stereotactic radiosurgery focuses high-powered x-rays on a small area. It is a form of radiation therapy, not a surgical procedure. It may be used to slow down or stop the growth of tumors that are hard to remove with surgery. It may also be done to treat people who are unable to have surgery, such as older adults or people who are very sick. 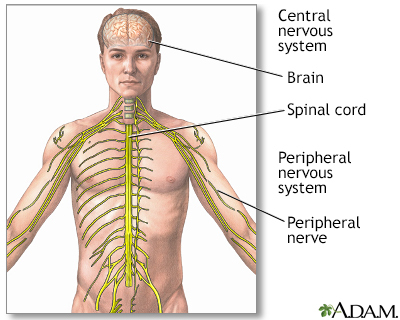 Removing an acoustic neuroma can damage nerves. This may cause loss of hearing or weakness in the face muscles. This damage is more likely to occur when the tumor is large. An acoustic neuroma is not cancer. The tumor does not spread to other parts of the body. However, it may continue to grow and press on structures in the skull. Hearing loss present before treatment is not likely to return after surgery or radiosurgery. In cases of smaller tumors, hearing loss that occurs after surgery may return. Most people with small tumors will have no permanent weakness of the face after surgery. However, people with large tumors are more likely to have some permanent weakness of the face after surgery. Signs of nerve damage such as loss of hearing or weakness of the face may be delayed after radiosurgery. In most cases, brain surgery can completely remove the tumor. Arriaga MA, Brackmann DE. Neoplasms of the posterior fossa. In: Flint PW, Haughey BH, Lund V, et al, eds. Cummings Otolaryngology: Head & Neck Surgery. 6th ed. Philadelphia, PA: Elsevier Saunders; 2015:chap 177.